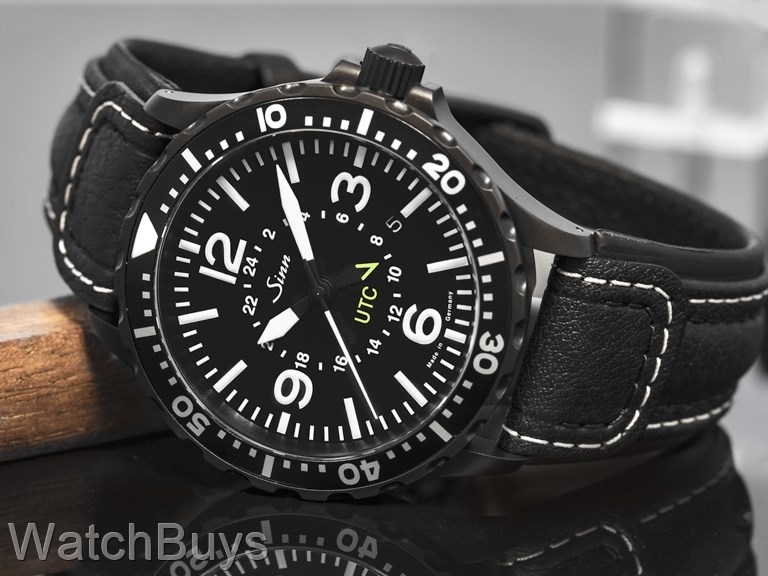 To create this watch, Sinn built on the extremely popular design of the Sinn 857 UTC and added a black PVD Tegimented case. The case features Sinn's Dehumidifcation Technology, which includes the use of inert gas in conjunction with a copper sulphate capsule which reacts with moisture to diffuse and absorb humidity in the watch. This capsule may be viewed through a porthole in the left lug, and over time will turn a deep blue as humidity is absorbed. This technology not only provides a more stable environment for the movement, but also helps to prevent fogging of the crystal when going from hot to cold environments or from humid to non-humid conditions (such air conditioned buildings). Sapphire crystal with luminous hands, hour markers and the 12. Watch is water resistant to 20 ATM. Watch is fitted with a Sinn calf leather strap and tang buckle. Verified Owner Comments: This is the most solid feeling watch I've ever worn. The size is perfect. It wears very comfortable. The dial is very easy to read. It is very accurate. Price is right. The UTC is comes handy for me when traveling the dual time is easy to ready quickly. Great service and fast shipping from watchbuys. Verified Owner Comments: This is my first mechanical watch and I am impressed with how accurate it is. The watch looks great and the strap is very substantial and attractive. Interestingly, more people have commented about the strap than the watch. The lume is a bit disappointing though. It's usually not legible in the dark. Not a dealbreaker though. Verified Owner Comments: Great watch and super accurate. Fit and finish are excellent. I have owned numerous Rolex and Breitling watches, and none of them have been as accurate as this Sinn...I guess we'll have to wait and see how it does in the long run. I'm really happy with it so far!